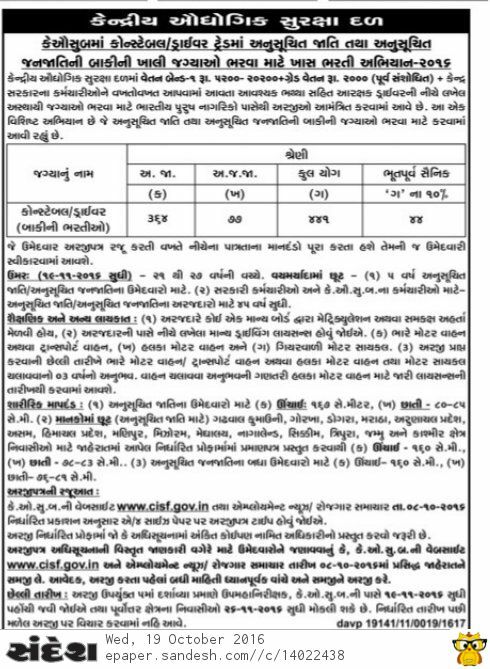 Driver Constable Recruitment:-Central Industrial Security Force (CISF) 441 Constable / Driver Recruitment 2016. Driver Constable Recruitment Central Industrial Security Force (CISF) 441 Constable Recruitment.candidates can for the desired post in the prescribed format on or before 19-11-2016,more detailed information regarding educational qualification,age limit,selection procedure,how to apply ,last date etc for CISF 441 Constable / Driver Recruitment 2016 are mentioned below. Educational Qualification : Read Official Advertisement & Get Full Details About Education Qualification. Interested Candidates may apply in prescribed application form along with Two self addressed envelopes (8 x 19 Cms size) duly affixing postal stamps for Rs.22/- thereon. Two additional self signed (in the front) passport size photographs are required to be attached duly clipped along with application form send to concerned Zonal DIG of CISF Office As Per Official Notification on or before 19-11-2016. Last Date for Submission of Application : 19-11-2016. Previous articleInterview Job:-District Health Society Arvalli Walk in Interview For Various Posts 2016. Next articleEducational News..Newspaper Cutting Date:-19-10-2016.